vacancies available in Municipal Corporation of Greater Mumbai. 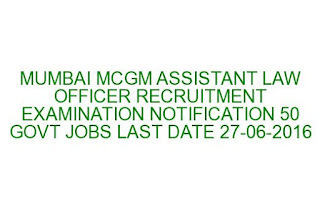 Eligible candidates may apply online for this Assistant Law Officer Jobs of Mumbai MCGM via the official website of MCGM @portal.mcgm.gov.in. 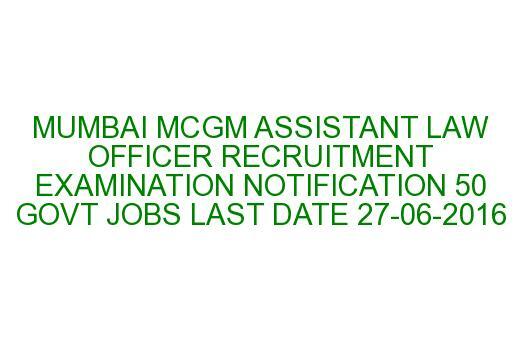 Selection for this MCGM Assistant Law Officer recruitment will be held through online objective type written test. For more information regarding this recruitment of Mumbai MCGM please see the details covered below. There are total 33 vacancies available in Mumbai MCGM. Candidates must have qualified bachelor's degree in law. Upper age limit for Open Category candidates is 38 years. Selection for this recruitment will be held based on written test and personal interview. For application fee details please see the official notification which is available from 07-06-2016. Candidates can submit their application online through the official website of Municipal Corporation of Greater Mumbai @portal.mcgm.gov.in. Click on online application form and select the post which is you are going to apply. Before submitting application form online please go through the official notification and user instruction carefully. And then fill the application form with all required data. The information which is you are giving it must be genuine. And upload valid photo and signature scanned copies if required. For more information please see the official notification. Apply Online here for Mumbai MCGM Assistant Law Officer Recruitment Examination Notification 2016. Download official advertisement of Mumbai MCGM Assistant Law Officer Examination.